I've often needed to mount a propeller to a motor shaft. This was often problematic, until I found this trick. It helps you drill holes down the middle. I usually use a piece of a metal rod to make the coupling. 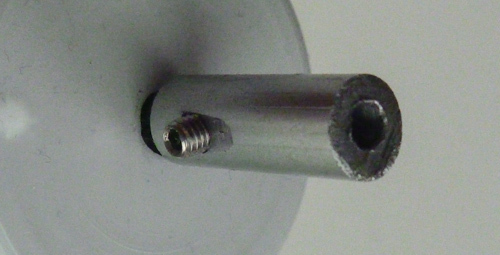 The hard part is to get the hole centered through the rod. Normally I would fasten the rod, and try to drill down its center. This mostly failed, so many tries where often needed. But I was doing it all wrong - instead I should have secured the drill! And it would have been easy. Here is a coupling made using this trick. The hole is little off though. But it is mostly because the speed on the machine I used couldn't be controlled very much (read cheap drill press).